A situation comedy about a young couple embarking on the perils of married life. Little do they know what lies in wait as they write their wedding vows. Allie is everyone's dream of a young wife—practical, patient, attractive. Peter is the boy next door—sporty easy going, and a bit of a larrikin. Little does the couple realise what lies in wait for them in married life. Much as they dream of a cosy life of domestic bliss, Peter's mates, Allie's "desperate and dateless" friend Marnie, her scatterbrained younger sister Jules and her depressive mother, Irene, constantly beset them. 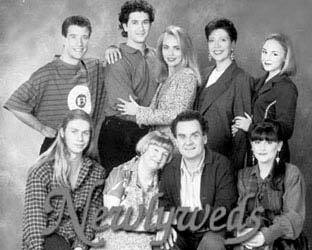 Trivia: Lisa McCune of Blue Heelers fame was originally cast as Allie Carter in the series' pilot but the role eventually went to Annie Jones.